Source: North American Electric Reliability Corporation, 2013 Summer Short-Term Reliability Assessment. Anticipated reserves of electric capacity—anticipated supply above expected demand—are expected to be below targeted levels in Texas this summer as they were last summer. California's overall reserve picture has improved, but reserves may be a concern under extreme weather and adverse supply conditions this summer. These are some of the takeaways from the North American Electric Reliability Corporation's (NERC) 2013 Summer Short-Term Reliability Assessment issued on May 15, 2013. The electricity utility industry uses a simple strategy for maintaining reliability: always have more generating and transmission capacity available than may be required, taking into account unexpectedly high demand or the possibility of unplanned outages of generators or a major transmission line. Yet it can be difficult to forecast electricity demand in the future, and building new generating plants can take years. The industry regularly monitors the supply situation using a measure called reserve margin. Grid planners compare these regional estimates of reserve margins to predetermined reference levels to assess supply adequacy. Reserve margin calculations involve expectations about demand and supply at the time of the systems' peak demand. Many factors can influence these calculations such as changes in economic activity, weather patterns, and various demand-response programs that can affect expected peak demand. Supply changes come into play, too, such as generating capacity additions and retirements, transmission upgrades, and other factors likely to affect the availability of supply. The peak demand projection for the three western regions increased by 2.7% on average between 2012 and 2013, and anticipated supply grew by 4.5%. In Texas, peak demand increased by 2.3%, while resources increased by 1.4%. The peak demand projection for the remaining regions in the East averaged 0.7%, with resources growing by 0.6%. The map shows 14 regional reserve margin estimates and the target reserve margin for summer 2013, which are derived from data in the NERC report. 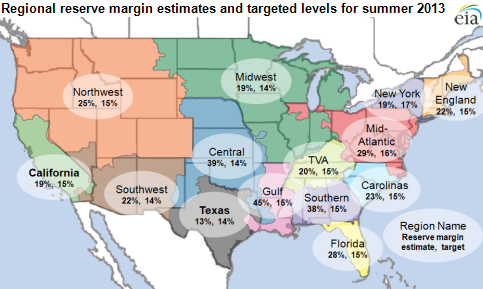 The reserve margin estimates exceed the target in every region, except in the Electric Reliability Council of Texas region (ERCOT), which is most of Texas. Although California is above the target reserve margin, it remains an area of concern especially in the southern portion of the system because of its reliance on imported power and the prolonged outage of the San Onofre Nuclear Generation Station.